‘Multimonica II’. The front panel controls of the Multimonica II, from left to right are: power switch and volume knob; six switches for different presets; tuning knob; two switches for different harmonic filtering; three switches for vibrato speed and amplitude; and power switch for the blower fan. 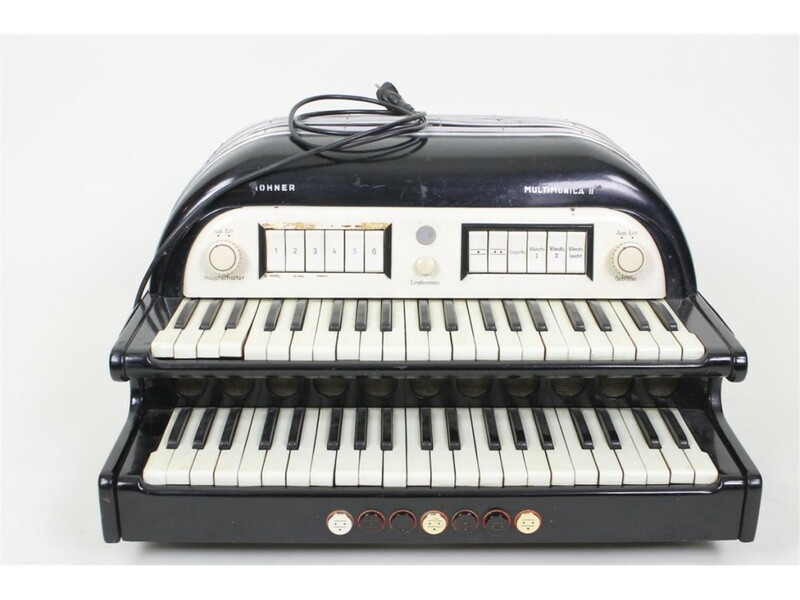 The ‘Hohner Multimonica’ was one of the first mass-produced analogue synthesisers. It was designed probably as early as 1940 but only came onto the market in Germany after the Second World War in the late 1940s. The instrument was marketed by the German company Hohner GmbH (known at the time for their acoustic harmoniums and mouth-organs) based on a design by Siegfried Mager (The son of German electronic music pioneer Jörg Mager) called the “Mager-Straube-Kleinorgel” (MAGER, SIEGFRIED, & CO. Hacklandweg 9, Wuppertal-Elberfeld, Germany – closed in 1970) with circuitry designed by the engineer Harald Bode – an important figure in electronic instrument design who was hugely influential on future electronic instrument and synthesiser design. The Multimonica was a commercial hybrid electronic/acoustic instrument with two keyboards; the lower one a 41 note wind-blown reed harmonium instrument, and the upper, an electronic monophonic sawtooth synthesiser. Housed in a modernist, streamlined black and white Bakelite casing, the instrument features a loudspeaker, tube-generated electromechanical vibrato, (The circuits were based on the Philips 13204 X, Philips EL41, Telefunken EF41 tubes in the Multimonica I, and EL41; ECC40; EF40 tubes for the Multimonica II ) 6 pre-set synth sounds, 2 switches for harmonic filtering, and 3 switches for the vibrato speed and amplitude, as well as a knee lever for volume control – some versions of the Multimonica I even had a medium wave radio built in; presumably to allow the owner to play along to broadcast music. The Multimonica II released in 1953 featured one loudspeaker and provided more types of harmonics filtering than the earlier Multimonica I, and the electro-mechanical vibrato was changed to a more sophisticated neon-gas-tube-based design. The audio software company Precision Sound created a virtual Multimonica Digital instrument in 2014. It is very exciting to read about the Mager-Straube here, as my father assembled the amplifiers for this instrument and we still have some original prospectus of it somewhere. Just for information, this instrument wasn’t developed by Hohner, but by Straube in Lich. Hohner later built an instrument based on that. And inventor Harald Bode wasn’t connected with the invention at all. My greatgrandfather, called Otto Pappe, worked for Straube in Berlin as production manager and became manager after Straube senior retired. The Straube factory in Berlin did not survive the second worldwar, but my grandfather founded the Straube Harmonium manufacture in Lich after 1947. He was known to Siegfried Mager (I wasn’t aware yet that he was the son of famous Jörg Mager), my father recalls him personally, too. So Mager developed the instrument with my grandfather Reinhard Pappe. Later, my father was apprentice at Lipp in Stuttgart, where he witnessed the early Wurlitzer Sideman bought by Lipp. We still have a lot of old papers and glass negatives from that era, but sadly no complete instrument.